Sweet Pete's Martial Arts Academy primarily teaches an art which is derived from the Kenpo that was cultivated in Hawaii by James Mitose and William K.S. Chow in the 1940's. Kenpo is basically a streetfighting self defense system. It utilizes powerful linear moves with circular flowing techniques and takedowns that blend with continuity. It is known for quick strikes and effective close range fighting, which makes it the "hard-soft" style it is called. Chow's student Ed Parker brought Kenpo to California in 1956 and started a successful chain of IKKA(International Kenpo Karate Association)schools. Parker's lineage continues through Al and Jim Tracy (Tracey's Karate), Richard Willit (American Kenpo) and Orned "Chicken" Gabriel (United Karate Federation). 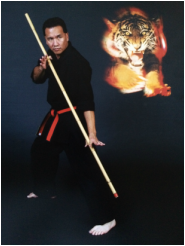 Gabriel's student, Pete Salas, opened the Chinese Kenpo Federation, renamed Sweet Pete's Martial Arts Academy, in 1985 in downtown Chula Vista. Salas trained directly under Gabriel and was also taught by Rey Leal and Steve Anderson. His martial arts experience was furthered by training in boxing, kickboxing, judo, jujitsu and tae kwon do and derobio escrima, he was mentored by Professor Wally Jay, Chief Al Tejero, Grandmaster "Blue" Generalao and Master Chief Chris Siangco. Today, Sweet Pete's Martial Arts Academy is renowned for it's innovative teaching methods, scenario-based self-defense work and highly effective sparring drills. Pete's approach to instructing is considered very unique, as is his close relationship with his students, instructors, parents and other martial artists. At Sweet Pete's Martial Arts Academy people say you can sense the camaraderie and the Lord's presence.